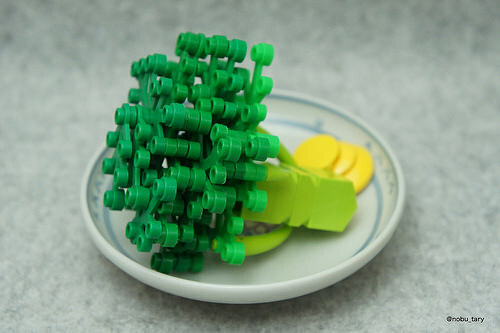 We all know how important it is to get your dose of fruit and vegetables each day and Japanese builder and TBB regular nobu_tary has two creations full of Potassium, Vitamin C, Vitamin B and …well actually they’re just LEGO. 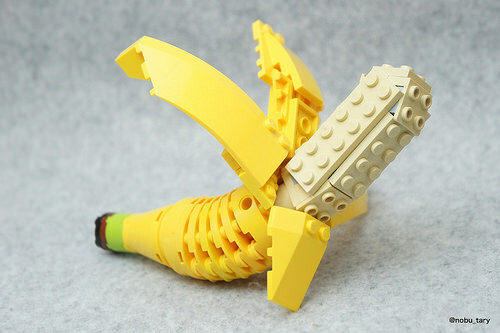 This is the best LEGO banana I have seen, the varied wedges are a perfect choice to form the peeled banana skin and the use of lime, reddish-brown and black at the end really adds to the realism. I also note that the builder has peeled the banana the ‘correct‘ way to avoid bruising the flesh. A plate of broccoli is the second build served up by nobu_tary. The angle of the photographs help the plant limb elements (Part 2423 and Part 2417) appear more ‘broccoli-like’ along with the lighter stem in lime elements.